Elevate your dog's dining experience. 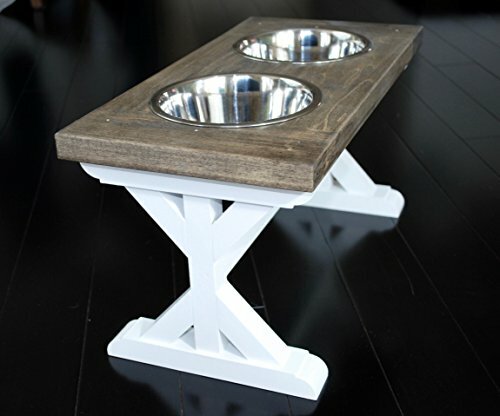 Expertly crafted, this raised farmhouse dog bowl stand helps keep their tasty dinner and cool water within easy reach. Ideal for medium size dogs breeds, this medium elevated dog feeder features three stainless steel bowls and will be customized to your liking, including your choice of colors for the top and base. Only the best for man's best friend! Made to Order Farmhouse Medium Raised Dog Bowl Stand • Great for medium breed dogs - Bulldog, hound, Corgi, Collie and more • Handmade from poplar wood - rugged hard wood that will last • Measures 18" long, 9" wide, 8.5" high • Sturdy "Trestle" pattern leg base - sits flat on the floor • Expert craftsmanship - breadboard ends, mortise and tenon joints • 2 - 32oz removable stainless steel bowls included, 5.75" round, 2.75 high • Bowls are dishwasher safe for easy cleaning • Many water-based color options (see photos) • Finished with a protective topcoat to ensure long lasting durability • Environmentally-friendly materials • Ships in approx. 2-3 weeks • Helps keep your floors cleaner!